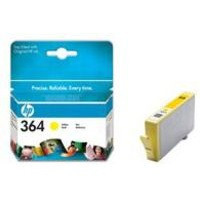 • Inkjet photo cartridge for HP printers. • Suitable for: Photosmart B109/B209/C5300/C5324/C5380/C6300/C6324/C6380/D5460/D7560/Photosmart Premium/Photosmart Premium Fax/Photosmart Pro B8550. • Page Life: 300 pages. For an ink cartridge that provides you with the very best prints with every use, this HP No. 364 Yellow Inkjet Cartridge is the perfect solution. HP is dedicated to making your printing as efficient and clear as possible, allowing you to achieve results that are fantastically defined, whether you are printing text or images. Working perfectly with your printer, you can be certain that you are making the most of your printer, achieving results that compatible cartridges cannot.